Planets are formed and orbit the sun, each spinning about its own axis. Planetary hours are formed when somebody notices this. Ptolemy, a popular-science writer, puts out an almighty tome exposing the astronomy of his day. He discusses an observer's view of, and calculations pertaining to, the motion of the heavens, citing two distinct phenomena - The Right and Oblique Spheres. Viewed from any position on the Earth's equator, the heavens move in stately procession from points along the eastern horizon to the equivalent points in the west. Any stars visible in the sky (except for any that might be exact "pole stars") all rise and set and are all visible (above the horizon) for 12 hours, and invisible/below for 12 hours. Such is the nature of the Right Sphere, under which the sky is as half an inverted globe with an apparent motion that confirms as much. Observers located away from the equator will also perceive the (static) Heavens as a hemi-sphere, but the stars' motion in the sky, taken together with their periods of visibility, does not re-affirm the illusion of a semi-globe. Here the stars rise and set in accordance with the "Oblique Sphere," under which northerly observers see the more southerly stars rise only to spend less than 12 hours aloft, whilst the most southerly stars never rise at all. Conversely, the northerly stars spend more than 12 hours above the horizon whilst the most northerly don't set at all. The latter just revolve about the pole star, as if in orbit around it, giving the impression that their region of the heavenly semi-globe is no longer concave but flat. Meanwhile, the remaining area of the Heavens - that which still rises and sets - behaves like a ladies fan, when measured according to the relative motion of its parts - or a bent cone, the apex of which may be found by looking due south to the horizon. In true Arthur C. Clarke spirit, true Arthur C. Clarke spirit, Ptolemy then turns his attention to Geography, Meteorology and more, including a four-volume compendium on the subject we now know, separately, as Astrology. Although in four parts, it is smaller than his astronomical work (and nowhere near as unambiguous) but this will not prevent it providing yet uncounted centuries of countless hours of fun, amusement and - as usual - mass-debate amongst astrologers. The Arabs seize upon and vigourously embrace Ptolemy's astronomical work. It is held in such esteem that they name this book "The Great(est)"; The name sticks, though not in Latin. Such is their enthusiasm, English-speaking people use their version of the Arabic name - Almagest. Some years later Placido, by now an acolyte of Magini, is also eager to be guided by Ptolemy ("…and reason") but doesn't stop at the four books. He bothers to study Almagest as well and is further aided in his researches by access to, if not the inheritance of, his mentor's tables. Emboldened by the publication of a couple of pamphlets, Placido goes on to set forth his Celestial Philosophy in a book thus named. He follows this with a text that gives instructions for casting and progressing secondary and tertiary horoscopes. He also describes primary mundane directions. - although the use of poles is wrong in principle, it would just about do. Judging by what happened next, few can have noticed that bit and, from here out, the fun really starts. Even fewer seem to have noticed (or believed or, as is most likely, understood) Placido's appeals to Ptolemy regarding the Oblique sphere, so his caveat goes unheeded. Indeed it was almost as if Primum Mobile had been published as a collection of tables with no explanatory text whatever. The false poles were taken as the model of the system itself, with "Placidus" himself copping posthumous blame for the travesty, when his name was attached to the division (by those who didn't even get that name right). Somewhere along the line, Commander Morrison, R.N. (Ret. ), though not himself responsible for the mistake, certainly goes a long way in ensuring its propagation. The first "Raphael" avails himself of a neat trick; a way to compile tables of semi-arc houses that doesn't require calculation. The procedure is not unlike the completion of simple, if large, soduko puzzle. This ensures that the semi-arc system prevails (in spite of all attempts to explain it). Mons. Henri Selva discusses a number of house methods in his essay, The construction of the celestial theme, published in French. This otherwise able paper falls at the final fence when the author attributes poles to "placidus"; but this is understandable since by now nearly everybody's at it. Not for the last time this century, one of our transatlantic cousins gets it right. J. Dalton bothers to read Primum Mobile properly and though his own prose lands upon the reader with all the grace and majesty of a fleet of winged bulldozers, he does at least relay the essentials accurately. Sepharial carries on regardless, his mistaken articles now appearing alongside Dalton's in the same magazine…. But nobody seems to notice the contradiction. André Boudineau sets the timer on Selva's bomb. He's read Selva, noted the problem and found a solution, which he proudly (and pompously) presents. The problem with Boudineau's solution is that it's not really a solution because the problem it solves was never really a problem. Indeed there would never have been a problem at all, had the pole merchants and Selva not conspired to misconceive it in the first place. Or was it Placido's fault? No matter - there it was - in print - a trigonometrical formula that avails a pole for any planet with no declination. Boudineau's formula floats off to the south-west, washing up in South America. Wendel Polich flees Hungary, high-tailing it to the Argentine where he swallows Casting the Horoscope in its entirety (including therefore the idea that Placidus used 'poles'). He also twirls little rubber balls around in an attempt to fathom what 'on earth' is going on with the tumbling skies. He pays singular attention to the conical observations of "Chandra" (in an appendix to Leo's book), thus latching on to the notion of a cone. He also has the misfortune to find, read and take seriously the 'pole' suggested by André Boudineau. Selva's bomb goes off. Those able to read smoke signals would see but one word in the resulting cloud: - TOPOCENTRIC. Polich's only gone and nicked Boudineau's device and used it to create houses. And people wonder at how come Topo so closely approximates Placidus. Hmmmm …It must therefore be - oh how did Harvey put it, now? - ah, yes! - "An Improvement On Placidus." The 20th century had indeed been a busy one for the Housing industry and Topo was by no means the only misconception to grace our PCs. By the time Ralph Holden gets 'round to repeating what Selva did in a mere magazine series, he needs a whole book to accommodate the avalanche of methods. And, unsurprisingly, they all divide the Right Sphere. 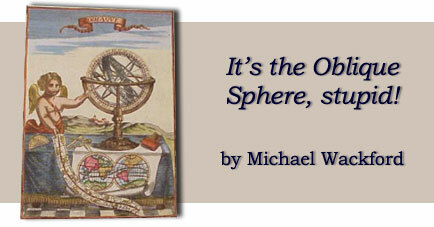 Or would that be the Wrong Sphere? Anyway, the cavalry rides to the rescue yet again, though a little late in the day. Hugh Rice had figured out a way to calculate Placido's real cusps and the late Neil Michelson had programmed it into a computer. As they say, "only the good die young." 1 ] Reported correspondence between Margaret Millard M.D. and Selma, Polich's daughter. Other sources include Michael Baigent, Patrick Curry, Charles Harvey, Ptolemy and Placido, Polich and Page, Sepharial, J. Dalton, A. Boudineau, H. Selva, A. Leo, Chandra, Jose Lebron and myself. Several useful anecdotes were supplied by Neil Gillings and Boudineau's article was provided by Denis Labouré, though translated by Michael Edwards. Unused sources include Raphael the 1st, A. Marr, G. Bennett, Cyril Fagan, Chester Kemp and Walter Pullen. The MD0 is Placidian and the rest is Histery (sic). © Michael Wackford. Published online February 2008.